I really like this tent, I’d give it 4 out of 5. If I gave ratings. I have had a long history of avoiding Vango tents. The first backpacking tent I ever bought was an Equinox 200. I took it out for a test run; a pole snapped and I discovered that the TBS straps had been stitched the wrong way around -so they locked in the wrong direction! I sent it back to the shop who returned it to Vango for repairs. It came back ‘repaired’ I discovered that they had done nothing and it was still as useless as before. I got my money back and bought a Terra Nova Solar 2. This tent was £100 more, 2kg lighter and still in great shape today, 18 years later! This experience and sleeping in other people’s Vangos over the years kept me away from the brand. Recently I bought equipment for my school’s outdoor education program. I needed the full works from tents to maps to boots. I was wary of Vango for the reasons outlined above but I had seen a lot of people were giving them good reviews. The Tempest 300 is on the Duke of Edinburgh’s Award recommended kit list. I took the plunge and bought some for the school. I wanted to try the tent so I could iron out any niggles or pitching problems before handing them over to students so I took one from the store on a camping trip with my two children to Kilchoan in Ardnamurchan in Scotland. The tent went up easily, I skimmed through the instructions in the bag -they seemed fairly sensible and straightforward: Three poles, colour-coded to pole sleeves on the fly. In common with all tunnels, peg one end, pull taut, peg the other end and the guy. The tent pitched quickly and all in one. The porch groundsheet clipped in and pegged out. Once the tent was up I tightened the peg adjusters and then the TBS2 Tension Bands which prevent sideways movement of the poles adding stiffness. Over the next three days we experienced bursts of heavy rain and prolonged winds with strong gusts. The tent took everything in its stride. I always left the top of the porch door open and rain never got in. A breeze blew through the tent from the open vent at the back and out of the top vent and porch meaning that there was never a drop of condensation on the inside of the fly -this is a pretty rate thing in these conditions in my experience. The tent is marketed as a 3 person tent. We used it with three people but two of them were under ten years old. The tent definitely would not fit three full-length (180cm) Thermarests inside, they’d overlap. We used two of these and a ‘body shape’ Neoair and they just about fit. The porch was fairly generous. We had waterproofs, wellies and a stove and plenty of room to move, put on or take off the waterproofs (one person at a time) in the closed porch. It would have been considerable more cramped with three large backpacks stowed in there. When it is used by the school the space should be OK. Three teenagers will take up a little less room (except for their kit, which will be strewn everywhere!). Overall I was very impressed with the tent. We had plenty of room, it was definitely strong enough for the wild West-coast Scottish weather and pitched easily. I’m glad I chose that model. I had a day to myself today and decided that a wander in the Yorkshire Dales was in order. The forecast was warm with light breeze and patches of sun. Definitely no rain. I packed a light bag and then made it heavy by adding my camera and its bag. I drove out to Malham, an absolute honey-pot for the tourists. Famous for its cove, tarn and for Goredale Scar. All of which would be swarming with walkers later in the day. Leaving the car a short way from the tarn I took a bridleway to the North East towards Arncliffe. My plan wasn’t to follow marked trails but to strike off from the track and find ‘things’ marked on the map. There were many antiquities marked in the Gothic font in the area and I wanted to try to find some, to practice my navigation and just to visit new places. Leaving the bridleway I plotted a course to take me to a tip (ruin) which was a couple of kilometres away. To get there I followed natural features (an edge) and walls. The area is all covered by CRoW Access land but I had to climb over several dry stone walls to get to where I wanted to go. In several cases there were gates which would have been useful but they were padlocked shut and often had barbed wire across the top -not very inviting to users of the land. I found the tip (disused) marked on the map. On the ground there was a large pile of rocks partly covered in grass and a large cairn-like structure. I took a bearing towards the next point of interest, a settlement just under a kilometre away. On the map it was shown as being in a ring contour, from this distance there was nothing to be seen. After a swig of water I set off back the way I came a short way, to climb the wall in the same place and climb the next one too. I had the map out at this point and began to get puzzled. The walls I could see on the ground didn’t quite match what I’d expected to see from the map. The angles seemed wrong. The contours were a pretty close match between map and ground but doubt crept in. I crossed a small valley, climbed up the other side onto the top of a small hill where I thought the settlement should be. There was nothing that my untrained eye could discern as human activity here. I was definitely on a ring contour though. I took off my pack and took out my phone to check the grid reference, just to make sure I hadn’t wandered off track. The GPS confirmed my location was exactly as it should have been which I was very pleased about. I’d not be much good as a mountain leader if I got lost in broad daylight! It had taken me quite a bit of time to get to this point in my walk. It wasn’t that far I’d traveled but crossing walls and careful navigating had cost me a lot of time. It was getting towards lunchtime so I walked on to a scenic spot where I could sit and test out my new stove. I had been walking for about three hours now and hadn’t seen a soul. Not one single person, near or far since I parked my car at about 10am. After lunch I walked northwards towards a small gorge with a stream flowing down off the hills towards Arncliffe. Contouring upstream to find a place to cross which didn’t require the use of a rope. As I got closer to the stream and to the bridleway on the opposite side I heard voices. The first other people in almost four hours. The voices belonged to two ladies enjoying the afternoon sun and two young boys building a dam in the stream. I said hi, photographed the view and walked on. I was running out of time now so I opted to follow the bridleway back to the car. Within a few minutes my people count was up to seven, then nine, then more. Back into the popular areas. The walk out had taken four hours. The walk back, along a well trod bridleway only one. I’ve recently added another stove to my little collection. When I began backpacking, about 18 years ago my gear was budget brand and heavy. Through the years I have upgraded and changed. The first stove I had was a solid fuel ‘hexy’ stove which cost about £4 with several fuel tablets. I still have and occasionally use that stove. Soon after I moved to a gas stove, a Coleman I think with extendable pot supports. It worked well and still does but it rarely sees daylight these days. I began to get fed up with gas stoves because when its cold, they don’t work very well. When the gas can is getting empty, they don’t work very well. When its windy, they don’t work very well. I bought an MSR dragonfly for my overseas backpacking trips. Its lot heavier than any gas stove but I liked it because it works superbly in almost all conditions -I once had difficulty priming it on a hot day in the Spanish Pyrenees, but other than that no problems. I also like the fact you can see how much fuel you have left so running out isn’t as much of a worry. This was my main stove for the majority of my backpacking trips. I began to re-evaluate my pack and its contents and decided I couldn’t justify the weight and space taken up by the dragonfly and its fuel bottle. The smallest, lightest stove I could find without paying silly money was an MSR pocket rocket. The reviews were positive and the stove is tiny. The Pocket Rocket is a really good stove, its powerful and gets water to a boil in a decent time and it weighs only a few grams. I had moved from using a pan in my cookset to a titanium mug to save weight. A 100g gas can, lighter and several drink sachets fit nicely inside the mug leaving only the stove itself outside making my new and improved (solo) cookset a heck of a lot lighter and smaller than the petrol stove, fuel bottle and pan it replaced. The stove is a fairly basic style and as such suffers the same problems as most other stoves (wind and gas pressure). This means I have ended up with a collection of part-filled gas cans! After another trip frustrated by wind increasing boil times to annoying levels -and being unable to cook in the tent porch I started to research ‘stove systems’ (MSR Windburner, MSR Reactor, JetBoil etc). They were all faster to boil and much more fuel efficient so the added weight of the heat exchanger was balanced by the better fuel use. After reading a load of reviews and having a long-term love of the brand I settled on the MSR Windburner. My third MSR stove! I’ve only been able to test it a couple of times and deliberately sited the stove in the breeze. The first time I used it I was amazed, I poured in enough water to make a coffee and it had boiled within thirty seconds. I’ve used it again to make coffee and with enough water left over for instant noodles. Again, the boil time was superb (I wasn’t geeky enough to time it!). Pros: Fast! More gas-efficient than the ‘normal type’. Continues to perform as the can empties. Last week I began the Hadrian’s Wall Path long distance trail with a friend and my two children (aged 6 and 9). The path runs across Northern England following the route of a Roman wall which was built about 2000 years ago to keep the Scots and Picts out of the Roman empire. For several miles sections of the original wall remain, although due to centuries of pilfering stones, not intact. The route is 84 miles long from Bowness-on-Solway in the West to Wallsend in the East. The route covers urban, rolling pasture and wild uplands along its length. We began our journey at the Western end hoping to finish off in familiar surroundings of Newcastle-upon-Tyne and a train back home to Bradford. The original plan was to cover about 10-11 miles per day and cover the whole trail in the eight days we had available. Two days into the route we revised our plan and aimed to do the first half at a more leisurely pace. We finished with a train to Newcastle from Bardon Mill (A few miles south of the path). It became apparent within the first two days that our pace wouldn’t allow us to complete the route in the time we had available. We re-planned with an aim of about 10km (6 miles) per day with plenty of time for resting and enjoying the views. This trip was Sophie’s (6 year old) first backpacking trip. Edward (9 year old) has been backpacking twice before and Mark has completed the Dales Way with me, but many years ago. All four of us carried a pack. Sophie’s contained her water bottle, sandals, sleeping bag and cuddly toy. Edward had sleeping bag, mat, clothes, sandals and water bottle. Mark and I shared out the rest including a tent each and two large bags of food to last several days. The first two days of walking weren’t through the most inspiring bits of the country. Some of it was pleasant enough but there were a lot of diversions and footpath closures which meant many miles on roads and tired feet. After Carlisle things improved as more of the route was through fields and countryside. The kids were enjoying themselves but wondered where the wall was. The western parts were never brick wall, they were earth mounds and ditches with wooden defenses atop them. It wasn’t until we reached Banks on the third day we actually saw ‘wall’ in the form of Hare Hill. This raised spirits immeasurably and we really felt that the walk was beginning at this point. Soon, our second section of wall was found with a ruined fort just after Banks, towards Bankshead and the camping barn we hoped to stay in – we were keen on showering. Unfortunately there was no answer at the farm where the camping barn was so after a while spent waiting near the farm we retraced our steps back into Banks and to a campsite. After Banks the wall seemed to be an almost constant feature with many mile castles and forts to keep us company. The countryside became more remote-feeling from this point, like we’d taken steps closer to wilderness. The ground was more rugged with craggy hills and rougher grasses rather than cultivated farm land. The ups and downs began to take their toll on smaller legs and the pace dropped appreciably. We were all glad to reach Greenhead and our bed for the night. The map showed a campsite which had been long abandoned. The youth hostel had thankfully been taken into private ownership by the local hotel and was still open. We were glad of the shower and accommodation that didn’t need building. To complete our evening of relaxation we went to the hotel for a delicious and reasonably priced meal. £10 for a main course – The chicken and haggis was superb. The sticky toffee pudding that followed it excellent too! We retired to our beds full and happy. The next morning we visited the ruins of Thirlwall castle and then the Roman Army Museum. Up to this point we had been very fortunate with the weather. Winds had been gentle, rain absent and nights mild. Throughout the next day the rain came down. Not especially heavy rain, but constant rain. We were heading for Once brewed and our final night under canvas. When we arrived the ground was sodden and everything we touched turned to mud. Once again we availed ourselves of the local facilities and ate in the Twice Brewed Inn. After a night of rain and mud we ate the last of the breakfast food we had brought, packed up one final time and walked out to Bardon Mill via the Vindolanda Roman Fort. Our timing was, by chance, excellent and within fifteen minutes we were on a train heading for Newcastle. As mentioned above the Western end isn’t the best. I think I were to do this trail again I’d begin at Carlisle. Its a lot easier to get to and the walking is better East of there. Many of the villages you pass through aren’t big enough to support a local shop or pub, this is bad if you’re looking to resupply or eat meals as you go. What we did find though is that a lot of the villages have honesty boxes containing soft drinks and snacks so light refreshment is possible as you go. We slept at the Roman Wall Lodges this was a small campsite with a couple of camping lodges. We could use the (excellent) facilities in the chalet. This campsite was five minutes walk from the pub, the Drovers Rest in Monkhill. Food was served here and it looked good but we had eaten in camp. Day 2: Cakes and ale Cafe a brief stop for, umm, cake and ale. Our stop this night was at Stonewalls farm campsite in Laversdale. This was a basic farm site but it had a handy shed containing a kettle and microwave. Day 3: Reading room cafe, Walton another short stop for cake and a drink. Lovely little cafe next to the village hall. We made use of an ‘honesty box’ for a coke which was conveniently half way up the hill on the way to Banks. The night’s accommodation was a campsite in Banks (can’t find a link. Its signposted at a house on the side of the road near the village green) We had hoped to stay in the camping barn but couldn’t make contact when we arrived. Day 4: Birdoswald fort for a drink and a cake. House of Meg tearoom lunch stop. We opted for the ‘all-day’ breakfast. (Served until 1pm). All very tasty except the sausages which were disappointing and cheap. The pub nearest the cafe was shut at lunchtimes but about half a mile away the Samson Inn was open and on the route. Our overnight accommodation was at Greenhead Youth Hostel (Independently owned). This gave us our first shower of the trip. We ate dinner in the hotel too. Good ale and food with reasonable prices. £10 for chicken breast with haggis -delicious. We’d expected to stay in the campsite marked on the map but it no longer exists. Day 5: We had an early lunch in the Roman Army museum cafe at Walltown before continuing on our way to camp at once brewed at Winshields farm. The farm had a tearoom, served breakfast and had a camping barn. We didn’t have opportunity to test these. Not really looking forward to a pasta n sauce dinner sat in a soaking wet tent we went to the twice brewed inn. The inn offered a range of ales and good food. It also had accommodation. Day 6: Vindolanda this was our final visit on the way to the train. Nice little cafe in the museum. I thought it might be useful to anyone else considering this sort of undertaking to offer information and suggestions about taking little’uns on multi-day walks. Pack weight: As light as you can! – throughout the trip as my pack got lighter due to food consumption I moved things from theirs to mine to make it easier on them. Bed: All of us had a Thermarest type mattress -yes, Karrimats are lighter and probably character building but I wanted peaceful sleep all round! Sleeping bags: We used lightweight summer bags and both kids also slept in onesies – these were only used in the tent to keep them clean. Footwear: The kids wore walking boots with proper walking socks. We all had sandals for in-camp use. Warm wear: Both kids had a fleece jumper and would wear waterproofs as a walking warm layer (Remember: they cool down much easier/faster than adults so wore more clothes as a general rule). Water: Make sure they drink it! -We took one of those super concentrated squash bottles where a tiny squirt makes a glass of squash. They liked to have their own packs because they felt like part of the team, they could also keep their own snacks and water bottles. Edward used an old pack of mine and Sophie used her school bag. As a walking backpack it wasn’t ideal as the straps were too close together at the shoulders which meant she needed a hood or similar to stop the straps rubbing her neck. I used this pack because it’s pink and she likes it! Sometimes giving in to their irrationalities is worthwhile to keep them happy. Both children took a small soft toy for bed time and a book each. During the day they took turns (sometimes argued about) at being the leader and going first. The trail is superbly well way-marked with the national trail acorn emblem so route finding was never an issue. Sophie as group leader finding the acorns. In order to keep pack weights down we had to be flexible with clothing choices and not to squeamish about repeat-wearing pants! The waterproof trousers and jackets doubled as a warm layer for the kids along with their jumpers. Edward wore his precious football shirts as his wicking baselayer, Sophie had to make do with standard T shirts. Shorts paired with waterproof trousers make a comfortable and practical set of legwear keeping the wind out but not too sweaty. On an evening, as soon as the tents were up the boots came off to dry/air and the sandals went on to let hot feet breathe. Dinners: A variety of things including: Uncle Ben’s microwave rice packets (add a little water to prevent burning) mixed with a ‘Look What We Found’ Chili con Carne’ (Three rice and one chili to get plenty of carbs) Good old pasta n sauce, Cheap Ramen noodles (BBQ beef flavour) and the best meal… Ainsley Harriot flavoured cous cous, chorizo (chorizo almost always makes it into my pack because its delicious, keeps well without a fridge and its delicious!) and dried apricots. Snacks and trail food: A bag of dried fruit and nuts, bags of ‘Percy pigs’ gummy sweets, marshmallows (also added to hot chocolate), jelly cubes. When we could we’d pop into cafes and have a drink and some cake to keep morale up and support the local economy! 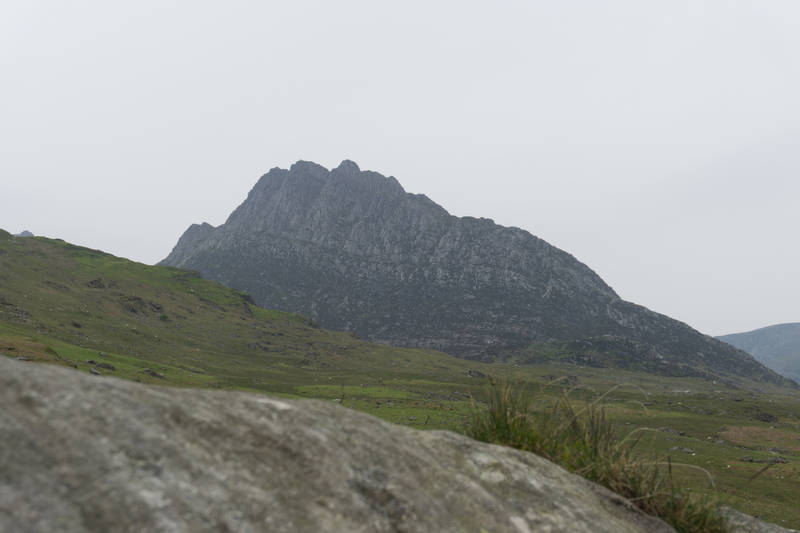 This last weekend I got in the car and drove the 120 miles or so to the Ogwen valley in Snowdonia. A place that I began my proper mountain walking journey almost twenty years ago. The views never grow tired. Old friends like Tryfan and Pen Yr Ole Wen on opposite sides of the valley. I’ve been there several times over the years but only recently ventured into the Carneddau on a backpacking trip last year. 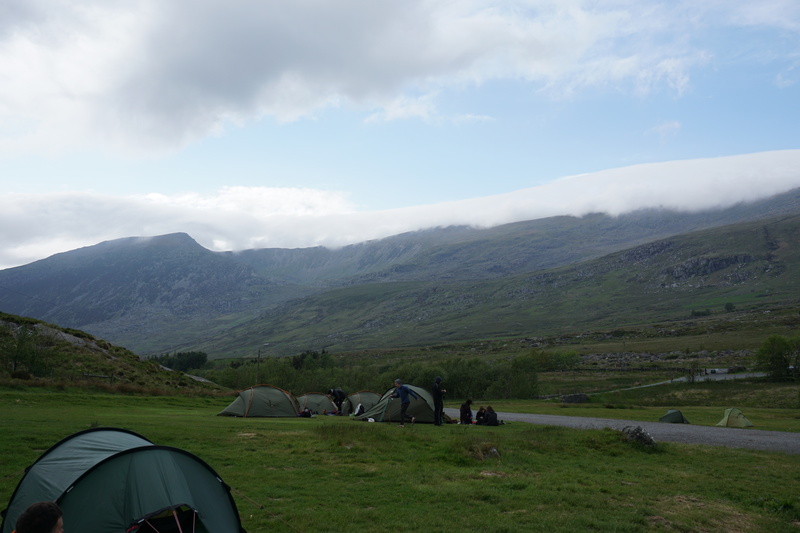 This time I was based at Gwern Gof Isaf camp site with a bigger tent and more gear. A comfy weekend of day walks. 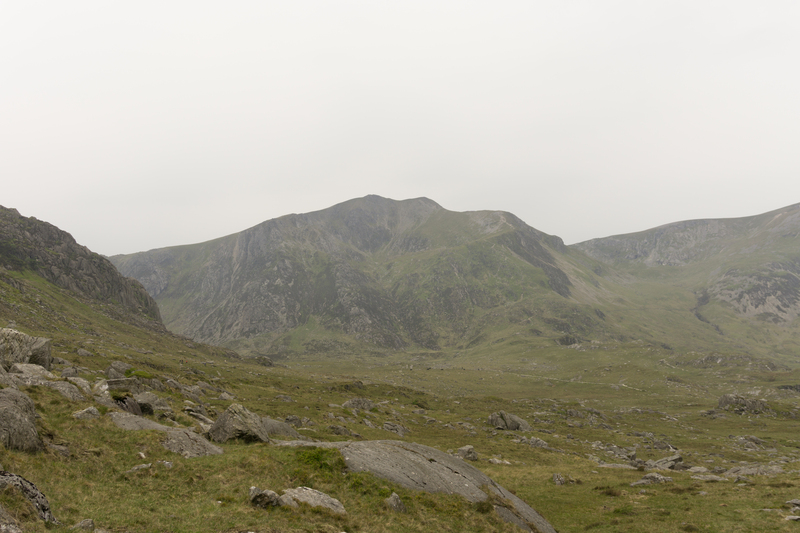 The original plan for the Saturday was a walk up Y Garn’s right hand ridge. I’d never been up Y Garn before and the line of the ridge looked really attractive. As we walked (Dan and I) from the campsite along the track near to the valley road we began to think up an alternative. The lower part of the right hand ridge looked a bit, well, dull. The upper part still appealed, it was just the zig-zag trudge to get there. As we approached the mountain a ridge to the left of the stream looked enticing. We imagined a route scrambling up the rocky ridge to the high ground and then maybe cut across to the other side near to Llyn Clyd. The scrambling was great fun. The rock solid and grippy. Little nobbles and bumps adding character and grip. Some of the sections were quite exposed and exciting -especially as we hadn’t brought the rope or scrambling guide with us. After an hour or more we approached the final section, the base of Castell y Geifr. Through the mist all we could see were rock walls with no way through. After a short discussion we headed left and found a gully. The gully wasn’t too loose and we thought it looked reversible if we found we couldn’t make progress through it. At the head of the gully we reached a short wall which we could climb onto from the right hand side. From here guarding the summit was an airy rock walkway and an imposing steep section with a large crack in it. Both sides of the walkway had long, steep drops. One side the gully, the other a boulder and scree field. I must admit that the thought of attempting to climb the last section with its inevitable consequences for failure didn’t appeal. Not without a rope (or even a guidebook to encourage us). After a look at the map and a short conversation we climbed down the opposite side of the wall and began to traverse below the walls of Castell y Geifr looking for an easier route onto the summit ridge. After a few hundred metres the wall dipped and all that separated us from the summit ridge was a short scramble over large boulders. After a quick lunch on the summit we turned to walk along the tops to Glyder Fawr. We encountered a large number of runners and walkers attempting the Welsh 3000 challenge. We passed and were passed by the same people several times over the next few kilometres. They were faster than us on the flat, then struggled on the ascents. Dan and I kept a fairly even pace over all the terrain. A while later, as we bypassed Castell y Gwynt a voice behind us asked if we were heading to the Ogwen Valley. We turned to see a man in mountain running kit, sporting a competitor’s number. We told him we were, heading to the campsite. He said he had been in the race but was giving up and wanted to head down to the car park. We pointed him in the right direction; “Get to that lake (Llyn Caseg-fraith) then turn left”. “This way” he said, pointing in the opposite direction. “no” we replied. “that way”. “Oh, Ok. Thanks” and off he jogged. We got to the lake and there he was again looking confused. “This is the Ogwen valley, isn’t it?”. “Yes” I replied taking out the map. The man looked puzzled and wondered aloud if that was actually the valley he wanted, or if he wanted to be in Llanberis! We sent him on his way to the valley where we knew there were marshals for the race. We carried on down a rocky outcrop straight to the campsite where we spent the evening wondering what became of the runner. On Sunday we set off for Moel Siabod. Via the café of the same name to eat the eponymous breakfast (highly recommended). From the café a short walk through the forest to the Plas Y Brenin mountain skills training centre took us to the start of the path to Moel Siabod. We eschewed the tourist path (dull) for a more interesting walk to the back of the mountain and an easy (striding edge-esqe) scramble to the summit. This route had none of the technicalities of the previous day but was just as much fun. Again the rock was dry and grippy and nobbly. I’m not sure what type it is but it makes good climbing rock! 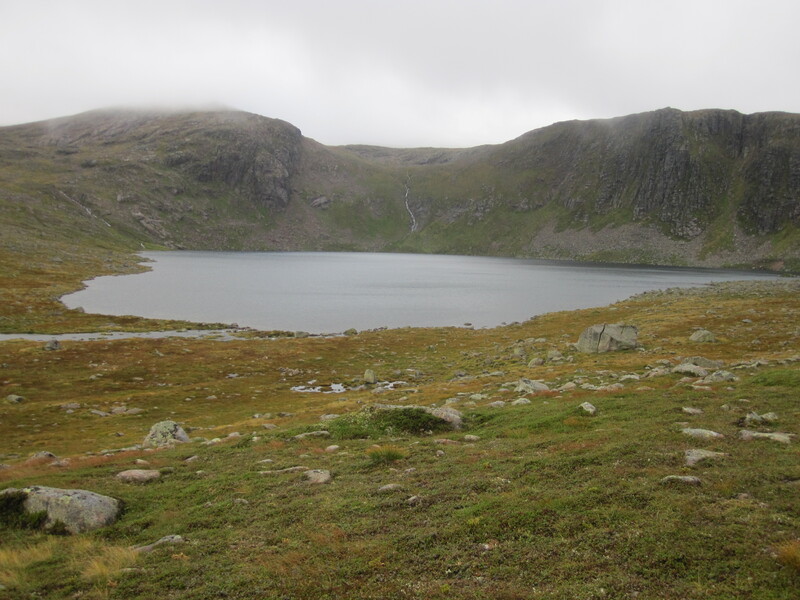 I spent an unseasonably cold August Bank holiday wandering the Cairngorm mountains of Scotland. I’ve been there before, twice. But in winter and from the Northern side where all the skiing is. I’d never really ventured far beyond a few km from the ski station car park. As this part of Scotland is 6 hours away from home by car I need to have a long weekend at least to make a visit feasible. On Thursday morning I loaded the car and set off up the M6 and over the border. By 5pm I was getting out of the car in the Linn of Dee car park and swatting away the infamous midges. I quickly applied some insect repellent, steeling myself for the airborne plague I would undoubtedly suffer for the next few days. Its rare I get from parking the car to getting on the trail as quickly as I did that day but I didn’t fancy getting eaten before leaving the car park. 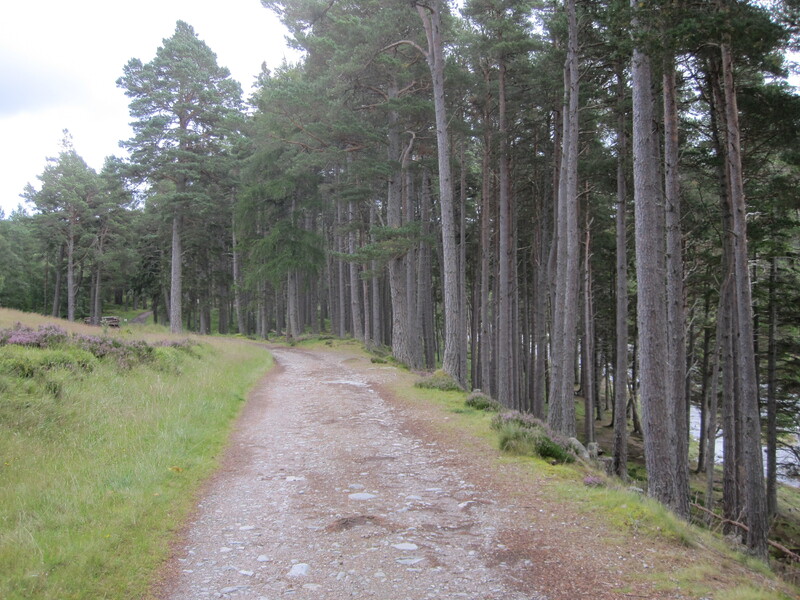 My route began with a few hundred metres down a forestry track to the edge of the woodland. Out here on the open moor there were no flies, I suspect the breeze had grounded them all. Stopping to put on my gaiters I surveyed my intended route. Uphill, through calf-deep heather towards a little hill called Carn an ‘Ic Duibhe. Halfway up the hill was a long and apparently recently erected double fence. The fence had little signs along it at intervals. The signs said ‘Caution! Electric Fence’. Hazard number one. There was a sufficient gap at the bottom of the fence to squeeze through without my pack on. I through my walking poles over lay down on my back and shuffled through taking great care to avoid the wires. Reaching back through I pulled on my backpack. Once on the other side I was free to continue my journey. Puffing and panting up the heathery hillside I was feeling decidedly unfit. I hadn’t been backpacking for a few months and had put on about half a stone whilst on holiday. Coupled with the heaviest pack I’d had all year and the toughest terrain I wondered about the wisdom of my plans. After a couple of hours walking I reached my intended stop for the night, a sheltered area just below the summit of Sgor Mor (813m). I’d seen an area on the map just lower than the summit and on the Southern side. I’d hoped it would be protected from the Northerly wind which was blowing in. It is amazing just how much difference a couple of metres makes. Down at my tent it was calm and not too cold. Outside the shelter of the hillock it was breezy and cold. I prepared my kit for the night and sorted out what I’d have for dinner. It made sense to have the heaviest food first so it was stuffed ricotta and spinach tortellini with meatballs in a tomato sauce. Pudding was a Mars bar. I popped my head out of the tent to look around and saw a group of deer about 20m from me. As soon as they realised I was there they bounded away over the hill and were never seen again. I’d brought the harmonica I’d been given for my birthday so I could continue my practicing while I was away. Checking there was no one about to be upset the noise of my terrible playing I played through a few short tunes that I’d learned from my ‘harmonica for beginners book’. Bed time comes early on backpacking trips so I was into my sleeping bag not long after 9pm. During the night it rained and so in the morning I had to put away the tent wet. This isn’t so bad if you’re going home but not great if you need to use it again. I checked the map and set off over the brow of the hill Northwards. Today’s target was Ben Macdui, the highest mountain in the Cairngorms and the second highest in the UK. 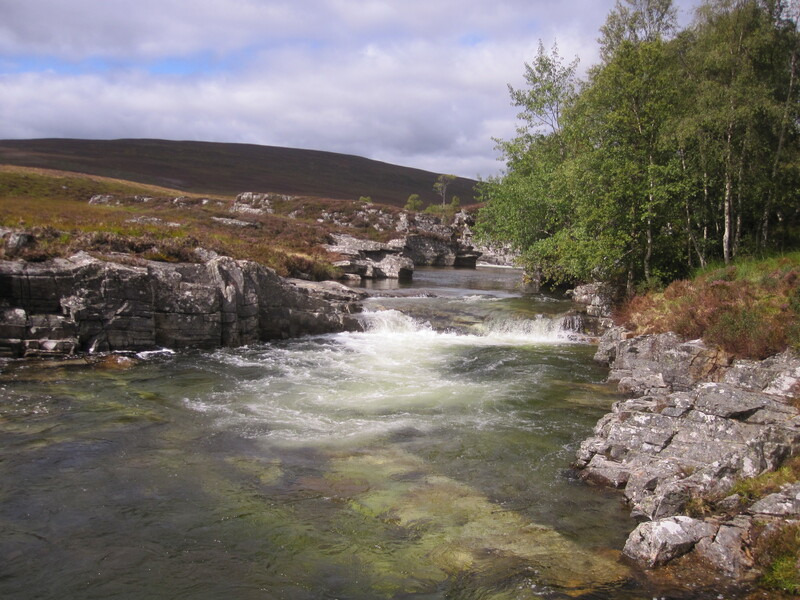 The reason I chose to head over the tops towards Ben Macdui was that in the weeks prior to my visit a ‘once in 200 hundred years’ flood had knocked out at least one of the footbridges over the river flowing from Glen Derry. Large parts of the footpath had also been damaged. The route from my campsite to Ben Macdui took me down into Glen Lui towards a bridge over the river. The latest information I’d found on the net was that this bridge was still extant. I could see the water level was still high in the burn but the bridge was still there. I stopped to fill my water bottle from a stream, no large flocks of sheep or people here. The river flowing quickly and clearly over a stony base. -It ticked all the boxes to be drunk without treatment of any sort. As I proceded up Glen Lui I needed to re-cross the river to get on to the hill Sron Riach. My recently purchased map (OL403, 2011 edition) showed a footbridge at NO012951 but I could not find it anywhere. There was no sign of a bridge washed away or damaged by floods either. (Later I noticed on the older version of the map (2004 edition) the bridge is not marked at this point. I wondered if it was an Ordnance Survey ‘fingerprint’ to identify copying). Fording the stream with the help of my walking poles I was on my way again, climbing into the mist. There was no footpath from Sron Riach to Ben Macdui either on the ground or the map so I followed the edge over a tricky boulder field to the stream running SW from the mountain. Following this stream to its source I got onto a clear track to the summit. The summit of Ben Macdui has many stone wind shelters, (perhaps a clue to the prevailing weather up there) a trig point and a view point stone. I could see very little from the summit, certainly none of the peaks listed on the view point stone. After a short while I retraced my steps towards the ruin and the path. I’d taken a bearing from the ruin to the summit on the way up in case I couldn’t see it on the way back. I’m glad I did because with all the wind shelters the summit looks similar in all directions when its misty. Descending towards Loch Etchachan I met a walker coming the other way. We stopped and chatted for a while. He was in shirt sleeves and feeling warm, he expressed surprise and my fastened up coat, hat and gloves. He said he was staying at the bothy below the loch. I had intended to camp near the loch but as I was cold and the weather was not expected to improve I decided to give the bothy a try. 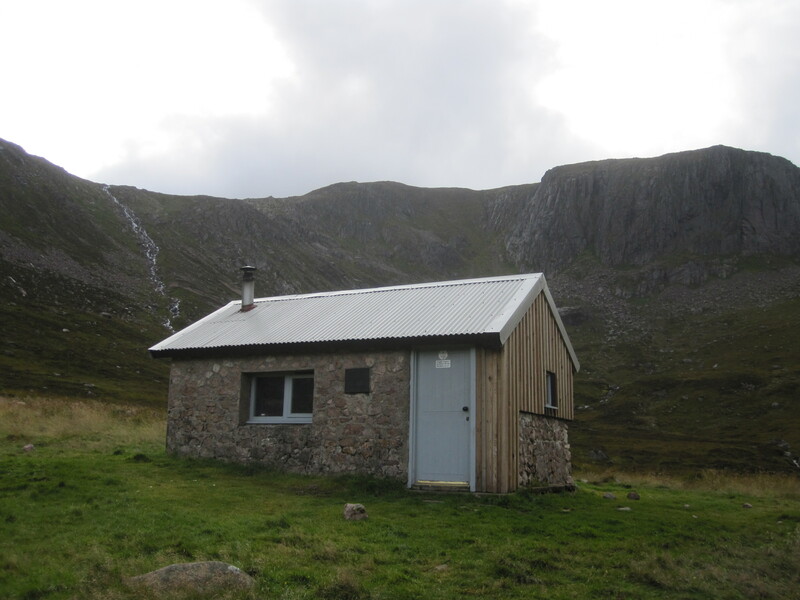 The Hutchinson Memorial Hut (Coire Etchachan Bothy) is a simple stone hut recently refurbished by the Mountain Bothy Association. It has a small entry porch with space to hang a few coats, leave boots and some backpacks and a larger room with a bench along one side and a stove. Bothies are free for anyone to use and are very popular. This was my first night in a UK bothy but I have stayed in similar huts in the Picos, Pyrenees and Sierra de Gredos in Spain. At the same time as I arrived at the Bothy a young French couple arrived from the opposite direction. Already inside was a German chap whom I’d expected as the man I’d met on the mountain mentioned he was there. We got chatting and worked out how many people were likely to stay in the small hut and thinking at least some of us will need to camp. I didn’t mind the thought of camping but I was looking forward to be able to sit and cook indoors. Eventually there were 7 people and 2 dogs at the bothy, this would have made it more than cosy. The man who’d brought the dogs and the German pitched their tents outside leaving 5 of us to sleep in the hut. We all cooked and ate inside and spent the evening chatting about mountains, veganism, Scottish independence and a variety of other topics. The conversation was helped along by a hip flask of Jura I’d brought along, just for this sort of occasion. Bed time came early and with three of us on the floor and two on the bench we said good night. The next morning dawned cloudy and cold but not raining and after breakfast I headed back up to Loch Etchachan. 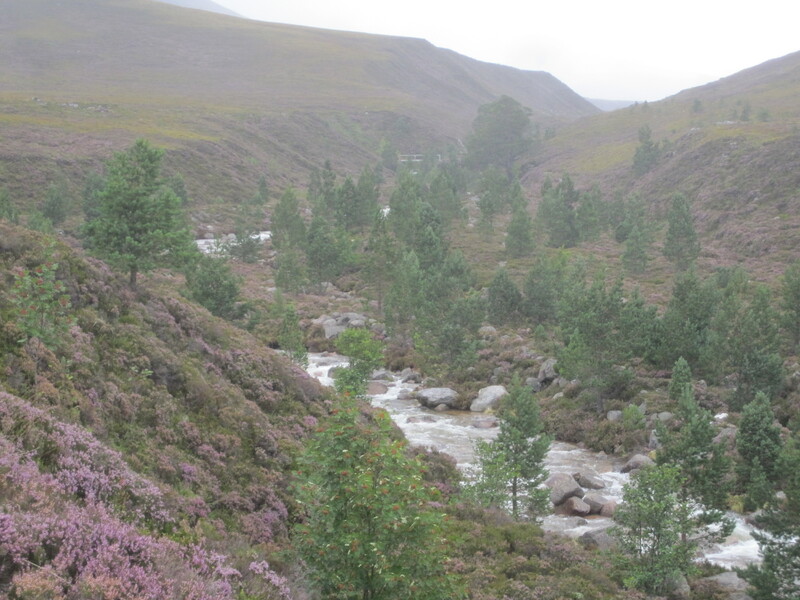 Three of the others took the opposite direction, back towards Braemar. I climbed up to the Loch feeling heavy and unfit, but happy after my enjoyable evening in the bothy. I crossed the stream as it left the loch and headed Northwest towards Loch A’an. The wind picked up and the rain started and got heavy. I stopped to don waterproof gear and carried on into the wind, descending to the Western edge of Loch A’an. I’d been told that I might see reindeer near to the loch so I kept my eyes open to see them. I saw no reindeer but I did see a couple of tents pitched on the loch shore near to a sandy beach. A beautiful spot, I made a note of it for future use. My path on the other side of the loch was a steep track up the side of a cascading stream. I stopped to remove the waterproofs before beginning the climb and set off. I made surprisingly good progress up the 250m or so climb to the flat ground at the top. Looking back over the loch to where I’d come from I remembered why I was there. I love being in wild places, hardly a sign of the modern world. For a while even the weather seemed kind. It didn’t last. Waterproofs back on I continued along the path towards the summit of Cairngorm itself. The heaviness returned. I felt slow and unfit once more. Eventually I reached the summit which was marked by a large cairn and a radio transmitter. 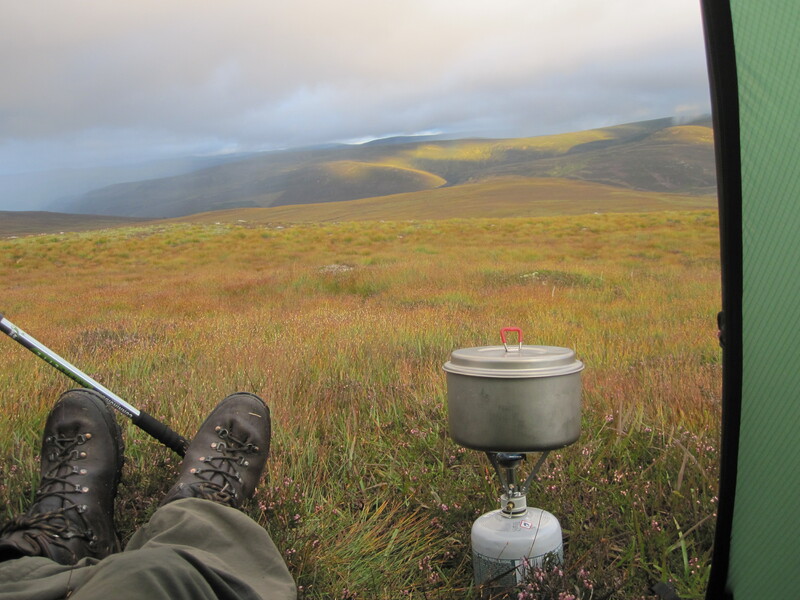 I took shelter on the southern side of the cairn and made myself some lunch. I had to remove my gloves to prepare my food and by the time I had got them back on they were numb and losing mobility. I wasn’t having the most fun being SO COLD IN AUGUST and thought about my options. I knew the weather wasn’t going to be brilliant but this felt like Winter and I wasn’t quite equipped for that. I had cold weather gear but I was missing my thick down jacket and winter gloves. I looked up the weather facts when I got home. When I was sat on Cairngorm it was 1.5°C. The wind was blowing at 25mph and above. This calculates to a wind chill factor of below -5°C!! -Descend towards the ski stations and work my way around to the car at lower level. -Maybe through Glen Feshie. No. That’s too far and I don’t have all the route on my map. -Stick to the plan and head West across the northern edge of the plateau, descending in to the Lairig Ghru. -This was a high level walk using the edge of the plateau as a ‘handrail’ until I could descend. I was confident in my ability to manage the walk but it didn’t seem like a ‘fun’ trip in the weather. -Retrace my steps and get back to the bothy where I know I’d be warm again and could dry off -This looked like the most sensible option. I’d be walking with the wind behind me and descending out of it. Right then. Back to the bothy it was. I packed up, wrapped up and set off. After less than 1km I’d reached the fork in the path; left to the bothy, straight on across the plateau. At that moment the wind dropped, the rain stopped and the mist lifted. I could see the Northern coires ahead of me and took it as a sign to carry on and not retrace my steps. I pressed on, stopping a while later to remove my waterproof gear once again. The walking felt easy, over Stob Coire an t-Sneachda, Cairn Lochan each footstep felt good. The views superb. I heard a helicopter below me and looked over the edge of the cliffs to see the search and rescue chopper hovering close to the rock walls before turning and flying away. The mist returned and a little drizzle but thankfully the wind stayed away. As I approached Lurcher’s crag I looked down into the coire I saw a small herd of reindeer. Too far away to photograph but definitely reindeer. 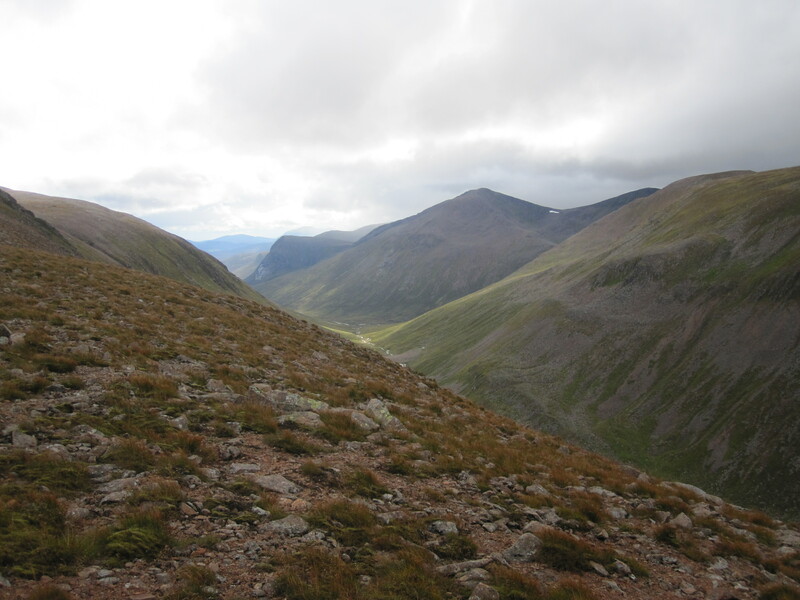 I turned north and climbed over Lurcher’s crag looking for a path down off the plateau into the Lairig Ghru. The map showed it as indistinct and I saw no trace on the ground. I checked my distances from summits and points on the map, I was definitely in the right place. Scanning the hillside below I saw a path a little way below me but nothing close by. I made up my own route to join up with the path and made it with no trouble. The descent was long and tedious. The path was rocky in places, boulder in others, long and occasionally steep. I was very pleased to get down to the river. 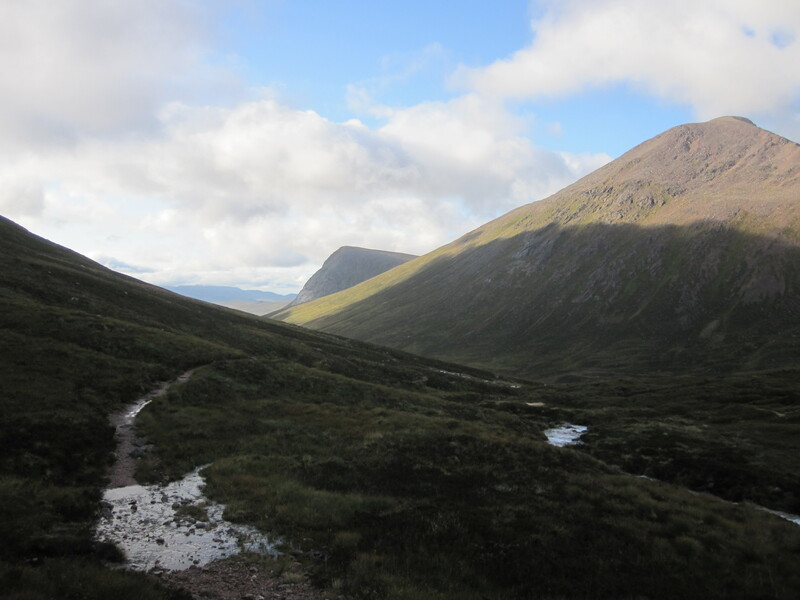 I refilled my water bottle and set off South into the Lairig Ghru. 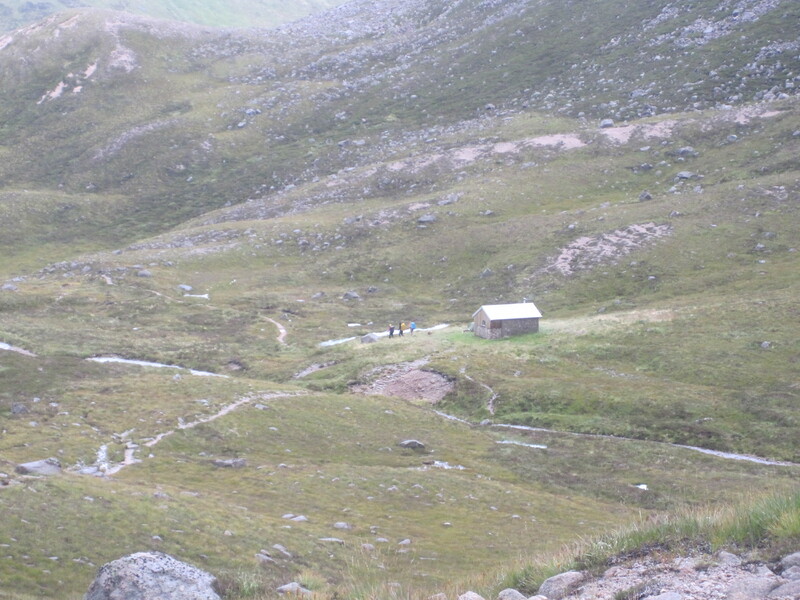 Seven km to the South of me was another bothy, the Corrour bothy. I had no intention of trying to make it there as my feet were tiring and a bothy in the middle of the Lairig Ghru would be absolutely heaving on a bank holiday Saturday evening. My map showed some potential camping spots a couple of km away, flat spots on the map -but would they be bogs? I needed a place which was flattish, levelish and with a little breeze to keep the midges down. The first potential spots turned out to be bogs but a spot a little further along, too small to see on the map turned out to fit the bill. 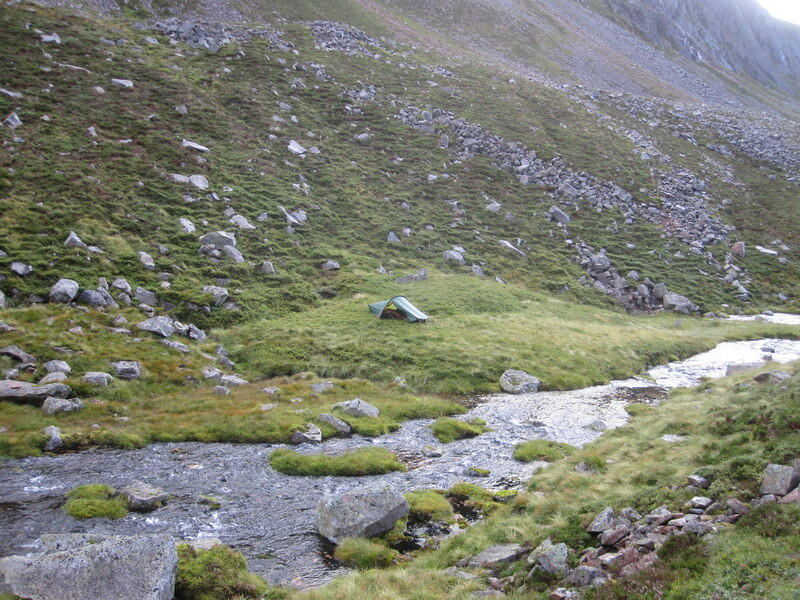 It wasn’t the most level site (I spent the night sliding down the tent) but it was midge-free and close to water. The rain began again and the wind picked up. I spent the evening in a very damp tent. Dinner was Super Noodles (I’ve remembered why I gave up on them as camping food now) and a dehydrated stew which was better than the noodles. A spot of harmonica practice and then bed time again. The next morning dawned cold and wet and I decided against getting a brew on in favour of a sharp exit. By seven o clock I was on my way to the car. I wanted to get back for about 1pm so I could arrive home before it was too late. The first two kilometres took me 1 hour as my legs refused to move quickly over the boulders. After the terrain improved my speed picked up and soon I was striding along past Corrour bothy and greeting my first passer-by of the day. I had chosen to follow the River Dee from its source to the car. This was because It looked good on the map and didn’t require me to cross any missing bridges. The final section of my journey began at the Chests of Dee where the track turned into hard-packed land rover trail back to the car. The final five kilometres flew past but my feet felt worn by the end of them. The journey complete I dived into the car before the midges realised I was there. I’d spent three days wandering the cairngorms in the height of summer and had barely seen the legendary pests. It had been close to freezing though and occasionally below.